Trump's Point Man On Israel Visits Netanyahu And Abbas To Discuss Peace Talks : The Two-Way The State Department says that Jason Greenblatt's trip to Israel and the West Bank is "the first of what will become many visits to the region." 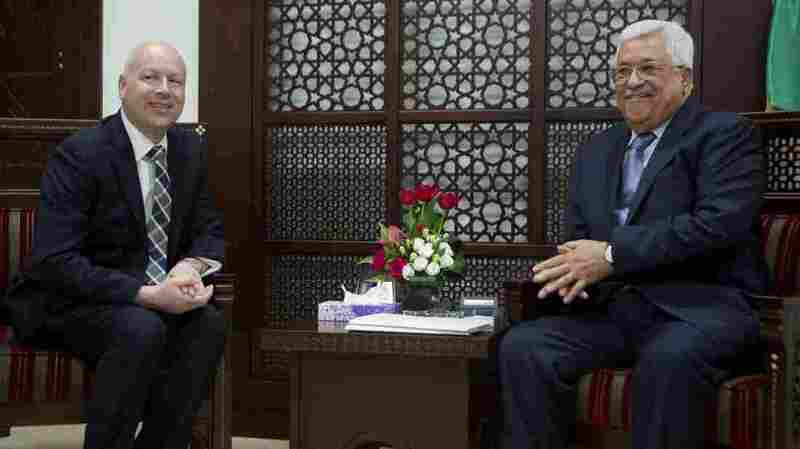 President Trump's peace envoy Jason Greenblatt (left) meets with Palestinian President Mahmoud Abbas in Ramallah in the West Bank on Tuesday. Jason Greenblatt, who went from being President Trump's longtime lawyer to leading his effort to bring a lasting peace to Israel, met with Palestinian Authority President Mahmoud Abbas in the West Bank on Tuesday, one day after Greenblatt met with Prime Minister Benjamin Netanyahu for talks that touched on Israeli settlement construction. The State Department calls this an "orientation trip" that's meant to hear from the two sides about returning to peace negotiations. "Trump has asked Netanyahu to curb settlement building. Greenblatt said Trump also wants the Palestinians' economy and quality of life to improve. Trump's envoy is also meeting with the Palestinian Authority president, amid a series of Palestinian street protests against the Palestinian leadership and its security ties to Israel. Palestinian riot police beat demonstrators and journalists at a weekend protest." Palestinian officials say Trump is poised to offer a "historic" deal to bring Abbas back to the negotiating table, perhaps during a U.S. visit that could come as early as next month. That's according to The Times of Israel, which cites the officials saying Trump might use promises of no more settlement construction and keeping the U.S. Embassy in Tel Aviv to give peace talks momentum. State Department acting spokesman Mark Toner says that Greenblatt's trip to Israel and the West Bank is "the first of what will become many visits to the region." The trip by Greenblatt — whose official title is special representative for international negotiations — comes one week after the Trump administration had two high-level contacts with Israeli and Palestinian officials. Last Tuesday, Vice President Pence met with Israeli Minister of Defense Avigdor Lieberman in Washington; and on Friday, President Trump invited Abbas to visit the White House, an invitation that came in a phone conversation about peace negotiations with Israel. According to the White House report on Trump's talk with Abbas, Trump "emphasized his personal belief that peace is possible and that the time has come to make a deal."